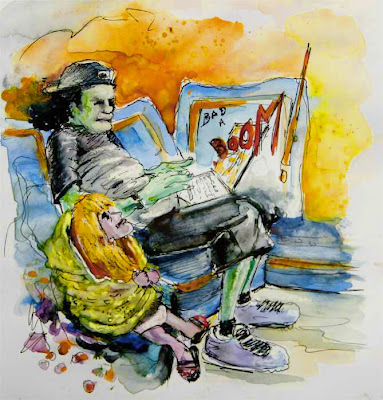 A Painter´s Life on Planet Goodaboom: Bad a Boom! In the middle of the night, a big bang awoke me. So loud that I really thought, in the first moment, the world is exploding, or at least our little home. But in the bedroom, everything was ok, except for the fact that my Kevin was not laying in my arms. In fact, he was not laying anywhere. The clock showed 4.AM. I got up, went down the stairs and found my Kevin sat on the sofa, in full Guevara Gear, all green in the face, tapping like crazy on the keyboard of his frigging computer. "Well, I´m trying to deactivate the remaining 5 power stations in America!" Oh God, I thought.... my Kevin is not the most patient one, concerning computers. "One just went up in the air... and the next is about to!"" One second later a big Boom came out of the computer. "My God, Kevin, we are supposed to be Good a Boom, and not Bad a Boom! What will people think!" "Baby, I have just blown up 2 American power stations, and you are just concerned about what people will say?!" By the way: Have you an idea what I´m writing about, here? A guess? Well, we are watching every day, late in the evening the American series "24". We love it, and are quite engaged in it, having all the time discussions about everything that happens there. So engaged that my Kevin, tonight, dreamt of it and woke up with the imperious necessity to try to help Edgar to deactivate the override device. After the 2 explosions I forced Kevin to go back to bed. I wonder what they will say in CTU tonight, when they see the mess... will they be able to trace Kevin´s frigging computer? I didn't guess "24" til you said so. Hopefully he's sleeping through the night right now!